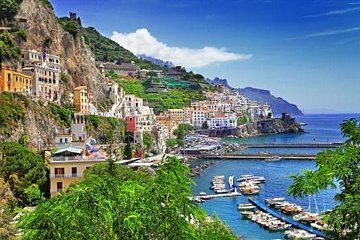 The Amalfi Coast is candy for the eyes with villages crawling from the Mediterranean Sea up mountains in southwestern Italy. The scenery is incredibly stunning and inspirational for composers, artists and moviemakers, and just about anyone else. The setting is so incredibly stunning that National Geographic considers the drive one of its ultimate road trips. 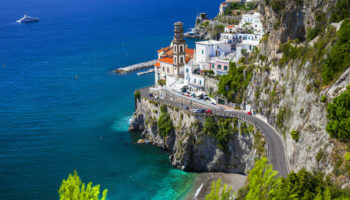 The drive along the Amalfi Coast towns can be made in about two hours, with a few stops, but why would anyone want to rush through one of nature’s treats. 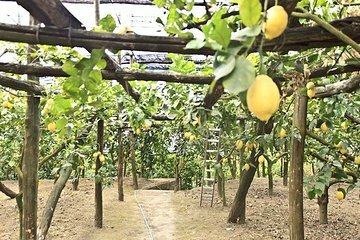 Take time to stop and smell the lemon blossoms, tour an ancient church, buy the colorful ceramics the region is famous for or just plain chill out. Furore is a little-known destination on the Amalfi Coast, between the towns of Amalfi and Positano. 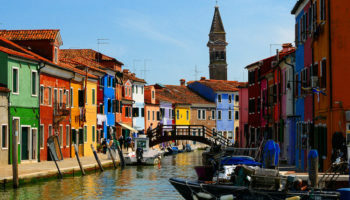 The village has a population of around 800, spread out over a vertical stretch of hillside high above the sparkling Mediterranean. The main tourist attraction is the dramatic Fiordo or fjord, where a cluster of old fishermen’s houses cling to the side of the rocky gorge. 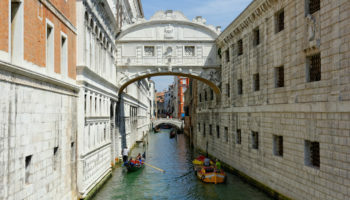 The Fiordo is bypassed by an arch bridge over which a road passes. The 30 meters (100 feet) high bridge is also the location where every summer the International Diving Championship is held. Vietri sul Mare, which translates as “Vietri of the Sea,” is the starting (or ending) place for the drive along the Amalfi Coast. Because of this, locals refer to it as “the first pearl of the Amalfi.” Located at the foot of Monte San Liberatore, Vietri sul Mare is known for making the dishes and other ceramic pieces that can be found in hotels and restaurants along this section of the Italian coast, which makes it a good place to buy colorful ceramic items. The famous majolica tiles are visible from miles away on the Parish Church of St. John the Baptist. Like other Amalfi Coast towns, Minori is steeped in history and legends, and their historical sites. One such is the Basilica de Santa Trofimemo, a martyr whose ashes were placed in an urn and tossed out to sea. It was washed up on the beach of Minori, with townspeople building a church in her honor. Another top site is the old ruins at Roman Maritime Archeological Villa, built around the first century BC. It’s noted for the remains of frescoes and tunnel vaults. 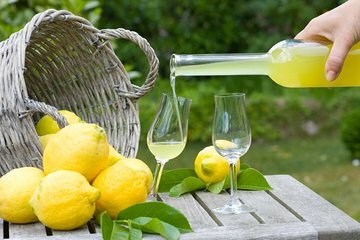 Minori is a good place to sample hand-made pastas and limoncello, a popular liqueur made from lemons in this area of southern Italy. Travelers who like seafood will want to sample the foods of Cetara, home to one of the biggest tuna fishing fleets in the Mediterranean. Try the tuna topped with colatura di Alici, a sauce made from anchovies, salt and water. Cetara has good swimming beaches, though some are reachable only by boat. Visitors especially like the Spiaggia Lannino, a sandy beach near the town’s entrance. Travelers seeking a romantic wedding in Italy can tie the knot at the Church of St. Peter the Apostle, a popular spot for weddings. The town also celebrates St. Peter’s day with a festival and fireworks in the summer. The Romans discovered the beauty of Maiori centuries ago, and the tourists haven’t stopped coming. This pretty little town was a favorite movie locale for Roberto Rossellini, who is honored every November with a film festival. Maiori has the longest stretch of unbroken beach on the Amalfi Coast, set against a backdrop of traditional houses climbing up the hillside. A top site is the Church of Santa Maria a Mare, known for its majolica tile dome that looks like a crown and September procession that winds around the city. The ruins of a Benedictine abbey above the town provide great views. Praiano was a summer tourist destination as early as the 10th century when it was the summer home for the doges from the Duchy of Amalfi. 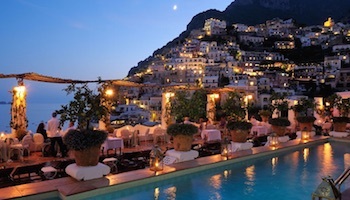 Located between Amalfi and Positano, the town is located on the side of a steep cliff. Praiano is a good place to relax, perhaps with a glass of wine at an outdoor café or taking a class in Italian cooking. It has several churches worth seeing, including the Chiesa di San Giovanni, with the pipe organ; the Chiesa SS Annunziata, which is located on a beach; and the Chiesa S Maria ad Castra, with its stunning views. Visitors seeking la dolce vita are likely to find it in Atrani, the tiniest town in southern Italy with less than a thousand souls. 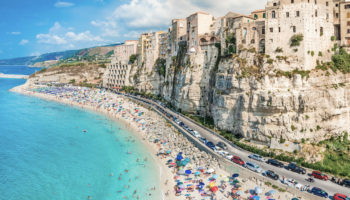 Because it’s so beautiful, the town is featured in many commercials, including the 2012 Fiat commercial, which is ironic since Atrani is pretty much a pedestrian zone. The Church of San Salvatore de’ Birecto dates back to the 10th century; at one time, it served as a palace chapel where rulers were crowned. The bronze doors depicting religious scenes are a must-see. Other top attractions include a small beach and the 15th century Torre della Ziro, a fortress that sits on a hill overlooking the community. Amalfi was an important trading center from the mid-9th to the 13th century. It was the capital of the Duchy of Amalfi. Today, it is a popular destination for tourists seeking stunning beauty set amidst historic charm. 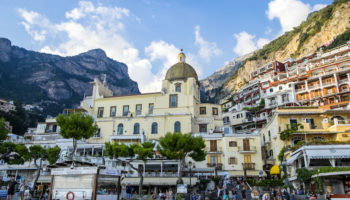 Amalfi is known for its outstanding medieval architecture, including the 11th century Cathedral of Sant’ Andrea, notable, too, for the four large ceiling paintings and the statue of St. Andrew that was sculpted by Michelangelo. The Arab-style Chiostro del Paradisio today is an open-air museum, though it was once the cemetery where Amalfi nobility was buried. 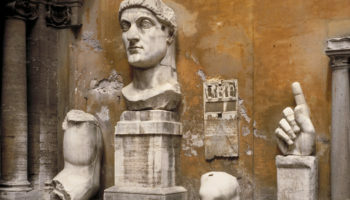 Since Amalfi was once known for papermaking, a visit to the Museum of Handmade Paper is a must. Ravello was once a safe harbor from barbarian invaders; then it became an important trading cente. 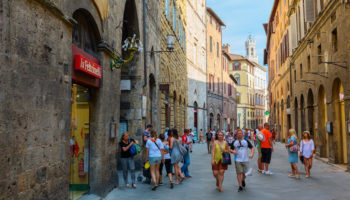 Today, this charming city with its cobblestone streets is a magnet for tourists who come for the scenery and breathtaking views, the best in the world according to former resident Gore Vidal, and certainly the best on the coast. The great composer Richard Wagner found inspiration here, so much so that the city celebrates the Ravello Festival every summer in his honor. 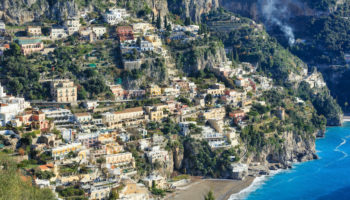 Top attractions include the Villa Cimbrone with its spectacular gardens and bust-filled Terrace of Infinity, and the Duomo de Ravello, deemed a must-see by Ravello visitors because of the beauty in its simplicity. Positano was an important city in the Middle Ages, but over the following centuries declined as many residents immigrated to North America. By the early 20th century it was just a poor fishing village, but its fortunes changed when tourists discovered this picturesque town that sites on a hillside overlooking the sea. A must-see for visitors is Santa Maria Asunta, a church that features a dome made of majolica tiles and a black Madonna. Positano’s stunning beauty is an inspiration for artists, including Mick Jagger and Keith Richards who wrote “Midnight Rambler” here. Positano was also featured in the 1994 movie, Only You. hi, we are globe trotters and are planning to visit the Amalfi coast this September. any recommendations of reasonable places to stay? Hotel Margherita in Praiano was beautiful. Rooms overlooking the water were spectacular and restaurant on the roof was excellent. Free cappuccinos all day long; breakfast and parking included.